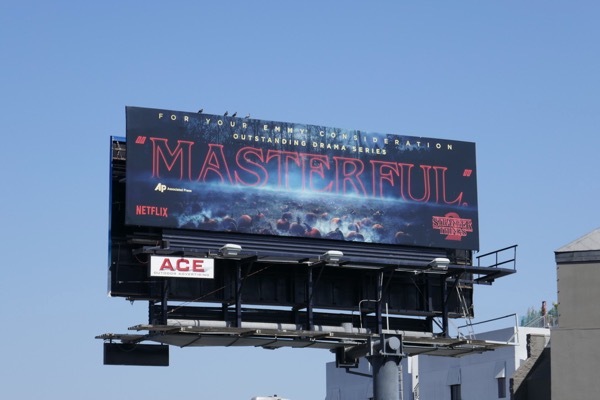 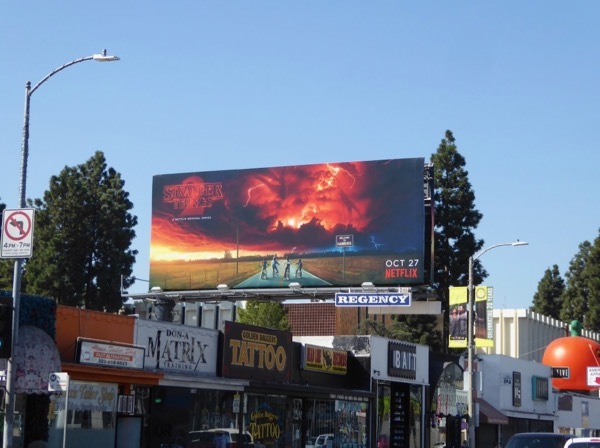 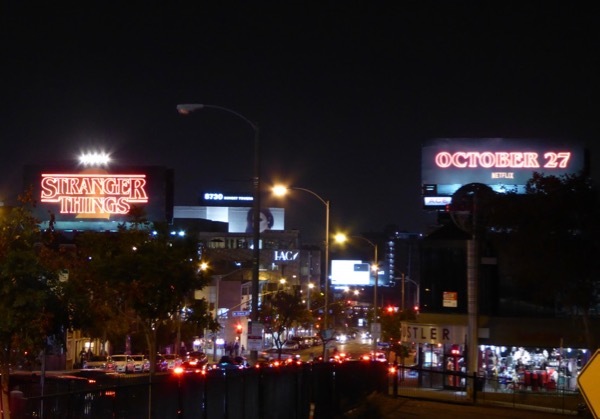 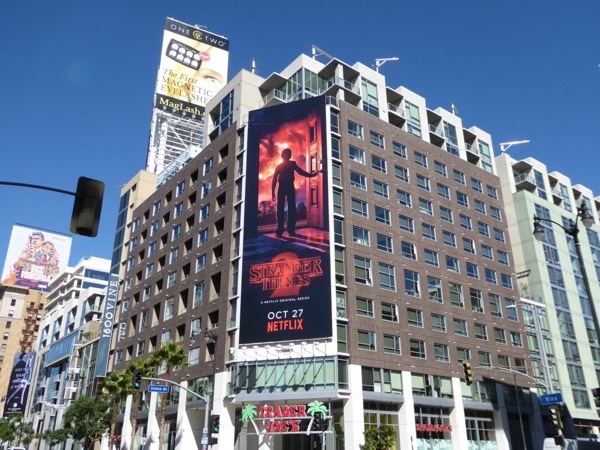 In case you weren't excited enough for the return of Netflix's award-winning Stranger Things, then these brilliant billboards filling L.A.'s skies with get you even more psyched for the nostalgic 80s-set sci-fi horror series. 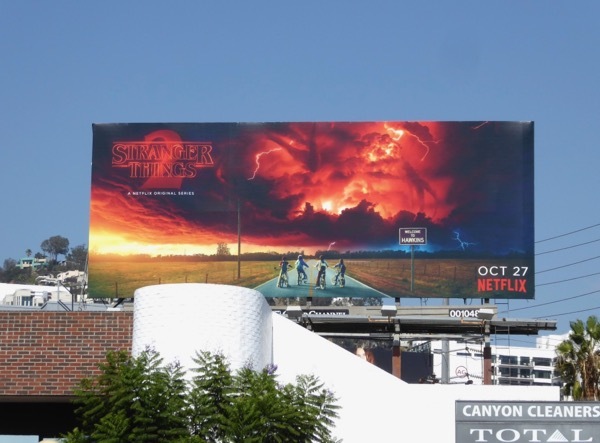 Yes, the skies are all aglow for the witching season along West Hollywood's heavily trafficked Sunset Strip at the moment with this duo of neon sign billboards installations that look impressive by day and night. 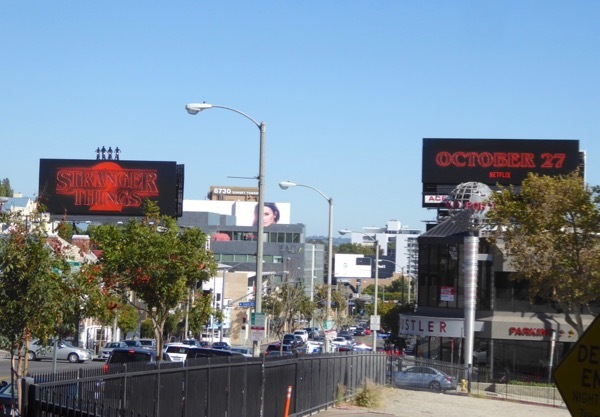 These interconnecting outdoor ads snapped on October 19, 2017, are made even cooler by the cut-out characters atop the billboards, which even have bicycle lights that illuminate for extra spectacle (and look even more vibrant in person). 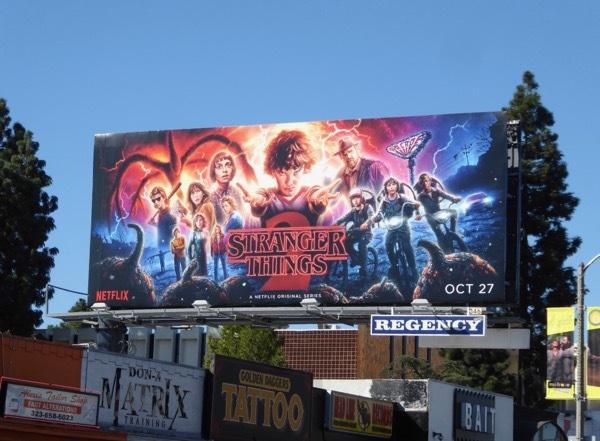 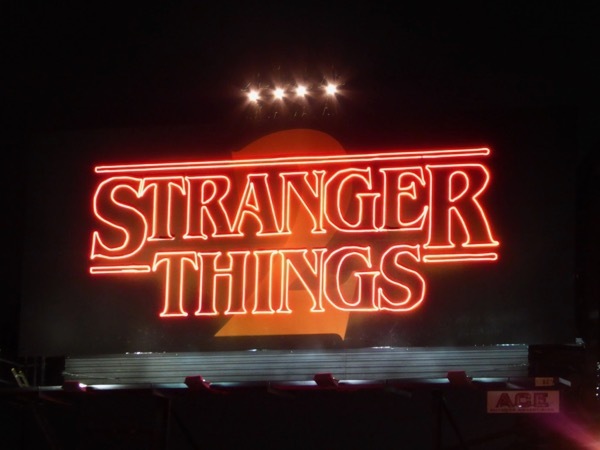 After saving 'Will Byers' (Noah Schnapp) from the 'Upside Down' and the Demogorgon monster, it appears that all may not be as it seems in the small town of Hawkins, Indiana, and there may be even bigger threats coming on the horizon for the nerdy friends to face. 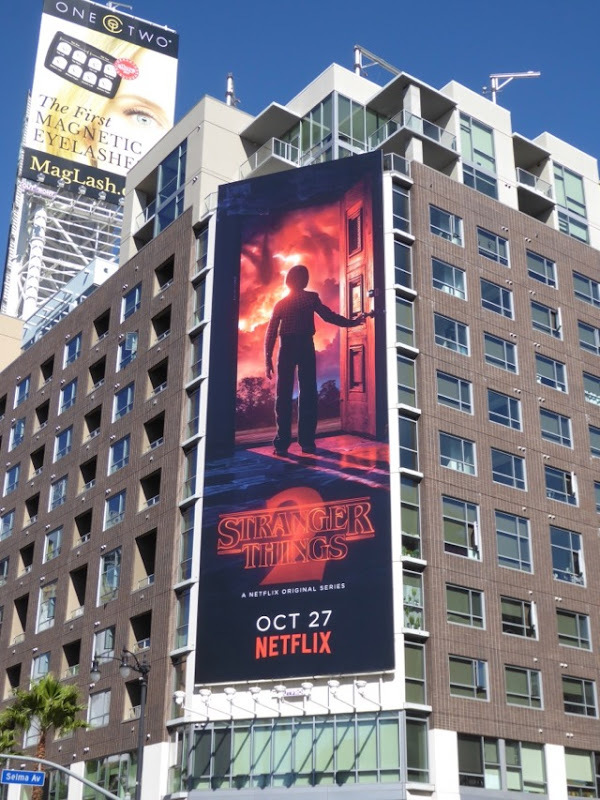 Set in 1984 it looks like this second season will be an even bigger nostalgia-drenched fest, it's even called Stranger Things 2 like a movie sequel. 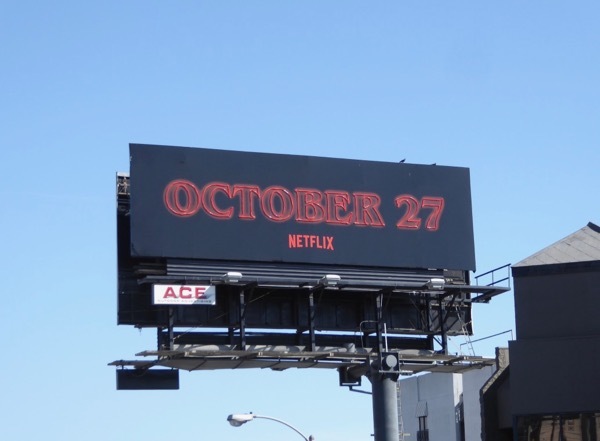 Expect to see more of Will, 'Dustin' (Gaten Matarazzo), 'Lucas' (Caleb McLaughlin) and 'Mike' (Finn Wolfhard) riding their bikes, trick-or-treating in Ghostbusters costumes for Halloween, teenage love triangles, the return of the paranormally-powered 'Eleven' (Millie Bobby Brown) and more ramifications from the experiments that happened at the Hawkins laboratory. 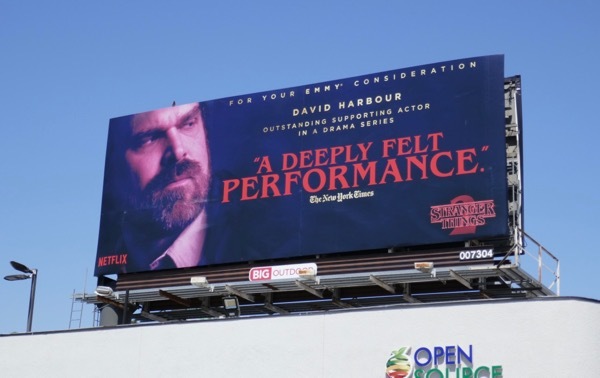 David Harbour's Police Chief 'Jim Hopper' looks like he's also back on the case investigating the mysterious happenings in the town, and you know that if anyone messes with Will his mother 'Joyce' (Winona Ryder) will do anything to protect her sons. 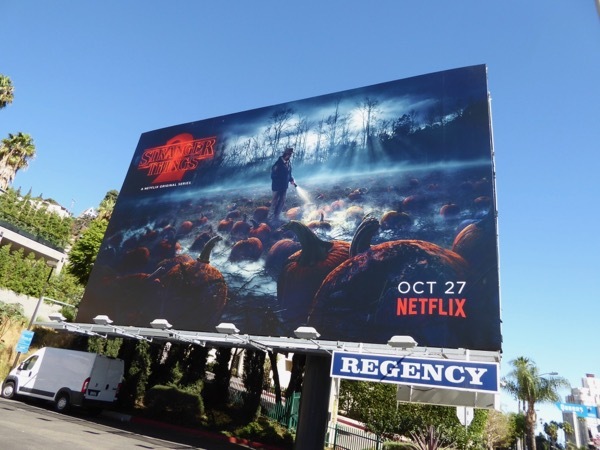 The standard landscape pumpkin patch ad creative was first spied along the Sunset Strip on Friday 13, then the other billboards including the Sunset Strip neon billboard installations were spotted along Melrose Avenue, Santa Monica Boulevard, Vine Street and Pico Boulevard from October 18 to October 22, 2017. 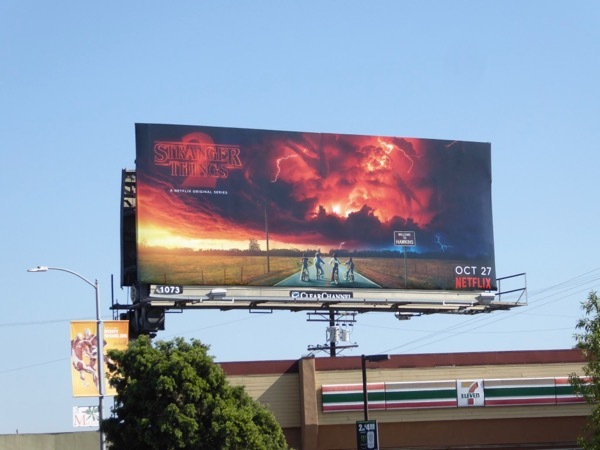 This outdoor ad campaign for the show's sophomore season certainly continues to evoke Spielbergian imagery, like mysterious doorways and kids on bikes, combined with the threat of Stephen King mists and monsters. 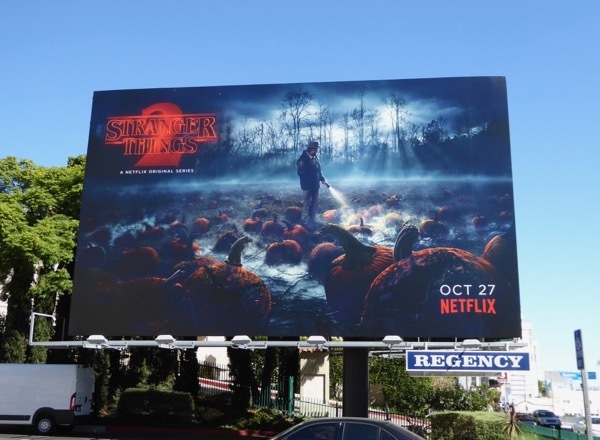 Fans of the critically-acclaimed series can also enjoy all these first season and awards consideration billboards for Stranger Things. 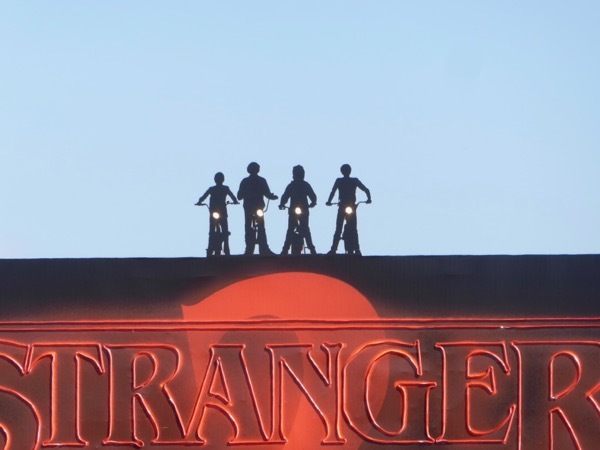 Plus you can also take a look at these original season one costumes from Stranger Things on display (especially if you're looking for some Halloween costume inspiration). 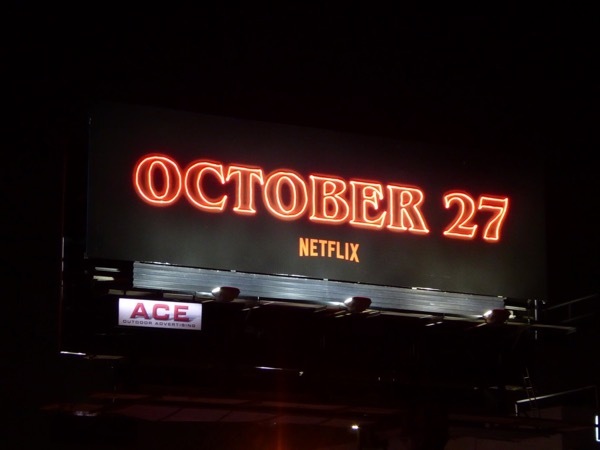 Something supernatural this way comes, and just in time to get you in the Halloween spirit. 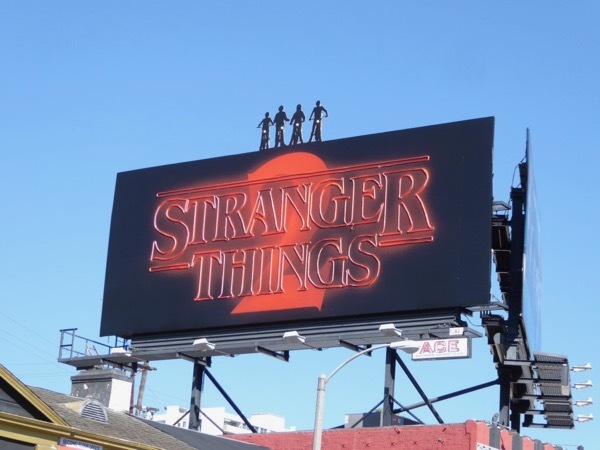 There's still time to binge-watch the original eight episodes, whether it's for the first time or you're re-watching to appreciate everything the new nine episode season has to offer. 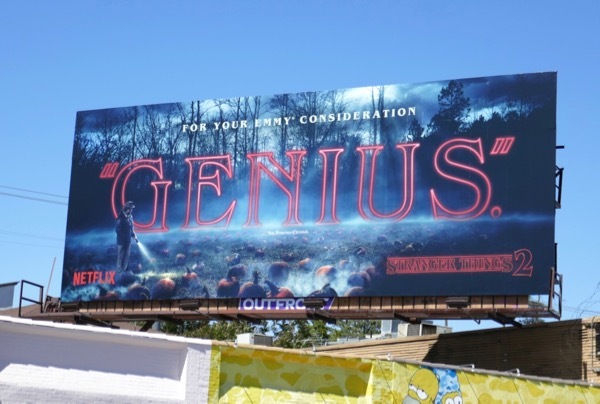 You shouldn't like things just because people tell you you're supposed to, but friends don't lie and Daily Billboard recommends you get ready to have your minds blown once again. 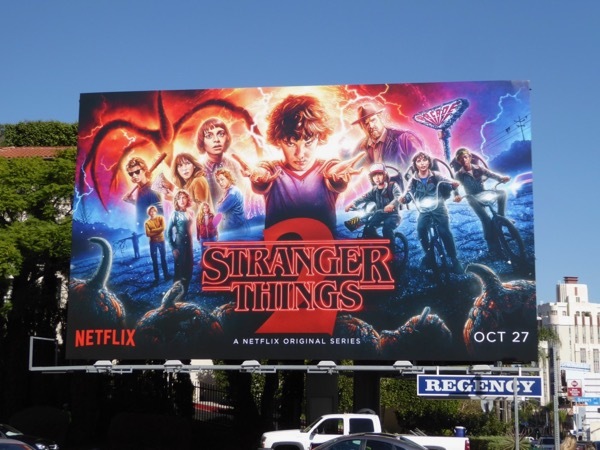 UPDATED: After all those teaser billboards for Stranger Things 2, here's some fab new illustrated artwork for the second season. 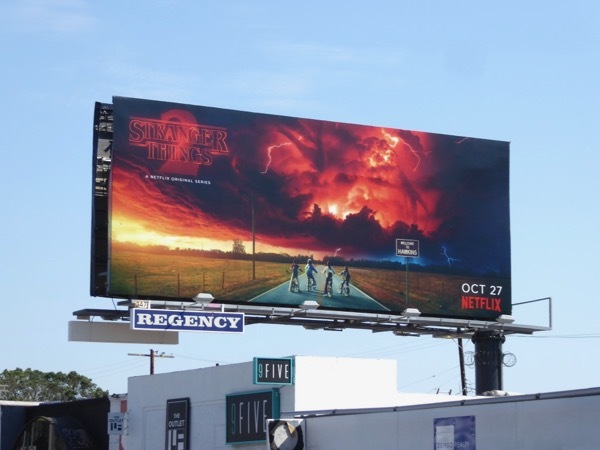 The artwork is once again drawn by Kyle Lambert and these billboards were spotted along Melrose Avenue, Santa Monica Boulevard and the Sunset Strip on October 25, 2017. 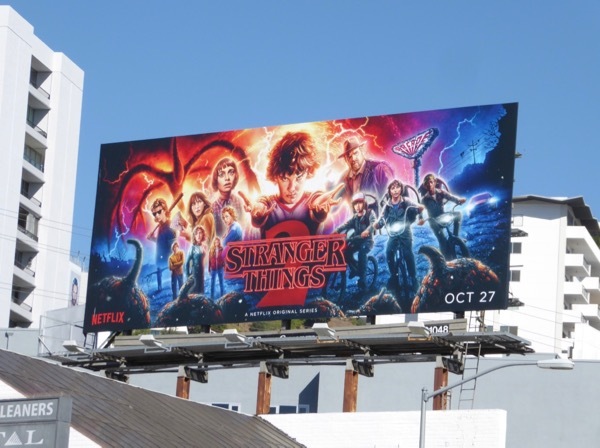 Eleven is back and she's sporting longer hair, Daily Billboard wonders if like Samson's mythical locks her psychic powers will increase in strength too. 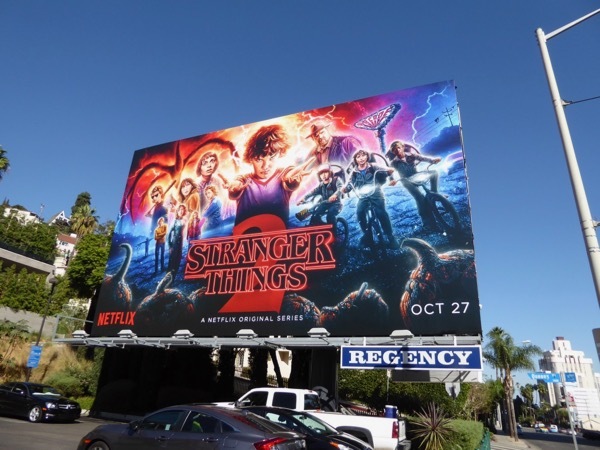 UPDATED: Stranger Things received two Golden Globe nominations for its sophomore season, one for Best Drama Series and the other for David Harbour for Best Supporting Actor. 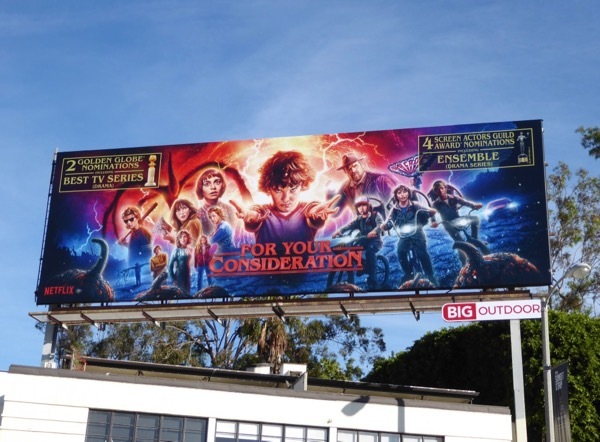 Here's a 'For your consideration' billboard for Hollywood's awards season snapped along Sunset Strip on December 11, 2017. 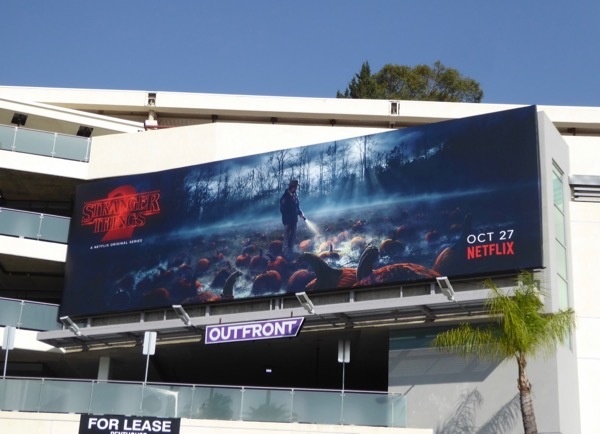 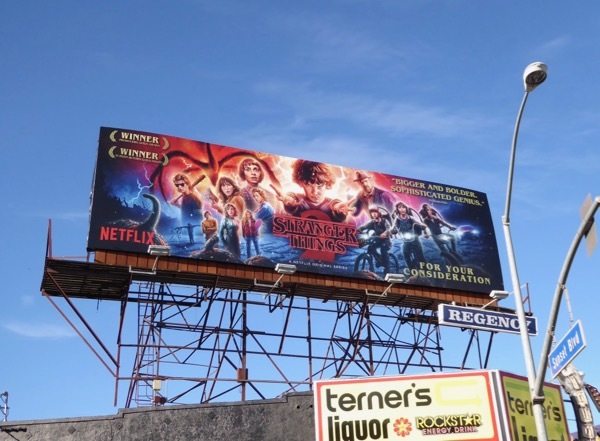 UPDATED: Stranger Things 2 may not have won either of its two Golden Globes, but there's still the SAG Awards to come and so maybe this FYC billboard snapped along the Sunset Strip on January 10, 2018, will help. 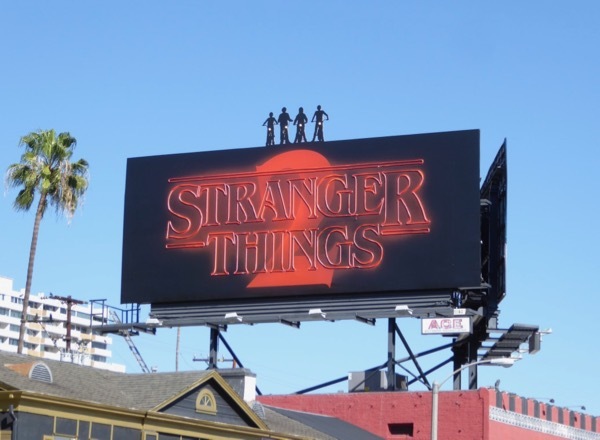 UPDATED: For its debut season Stranger Things was nominated for eighteen Emmys and took home five awards. 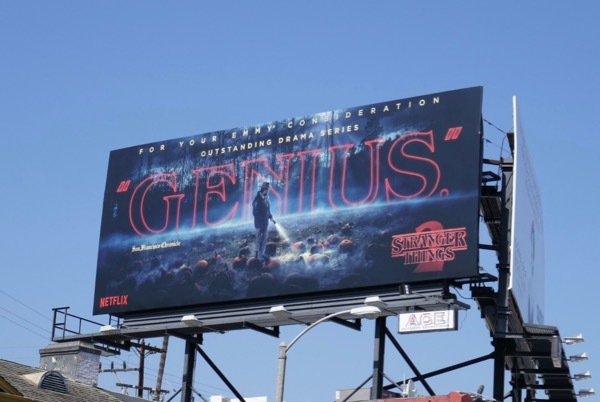 Can the show repeat this success with the help of this 'Genius' Emmy consideration billboard spotted along Melrose Avenue on May 24, 2018. 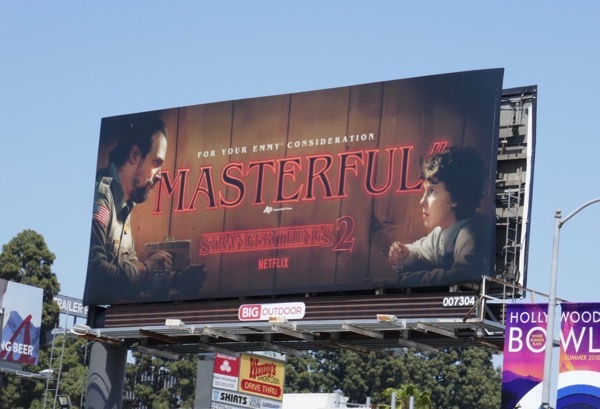 And here's another 'Masterful' Emmy FYC billboard, featuring 'Jim Hopper' and 'Eleven', spied along Sunset Boulevard on May 28, 2018. 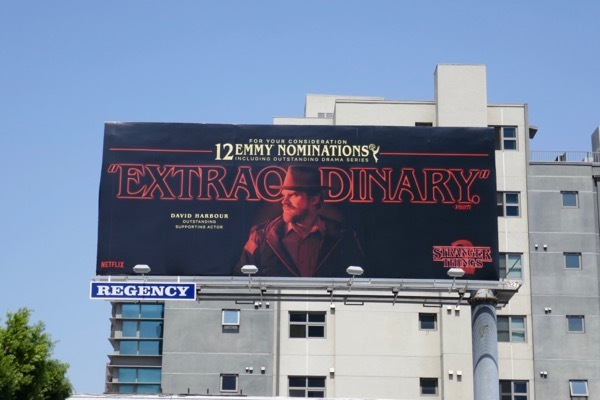 Plus here's a follow-up Emmy consideration billboard for David Harbour, snapped in the same Sunset Boulevard ad location on June 8, 2018. 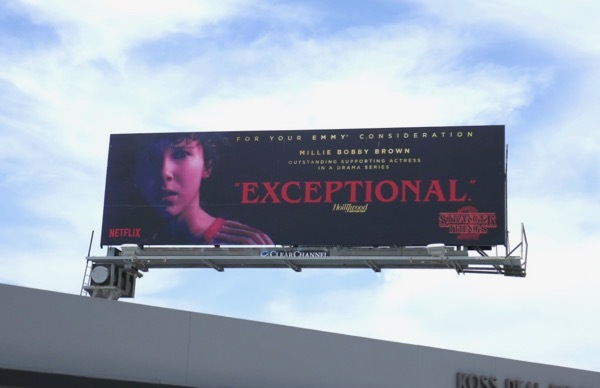 And a solo billboard for Millie Bobby Brown's 'Exceptional' performance as 'Eleven' spied along Santa Monica Boulevard on June 15, 2018. 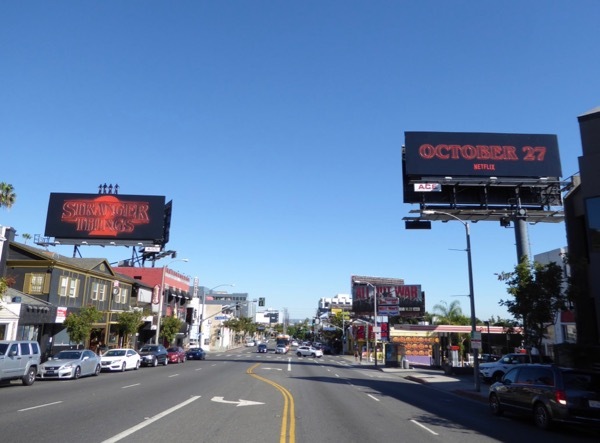 Plus here's also a duo of Emmy FYC billboards spied along the Sunset Strip on opposite sides of the road on June 20, 2018. 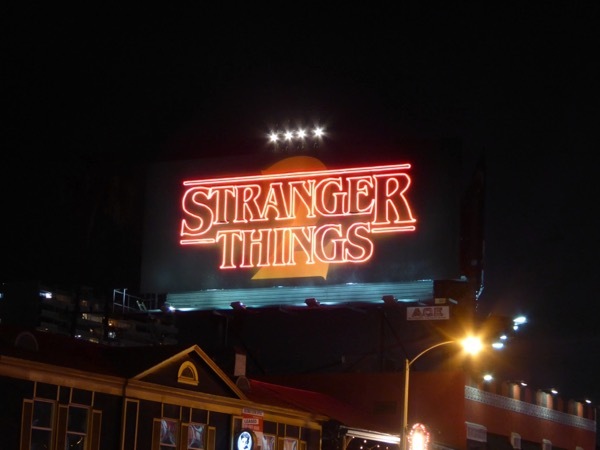 Let's see if this 'Masterful' television sequel can top eighteen nominations this Emmy season. 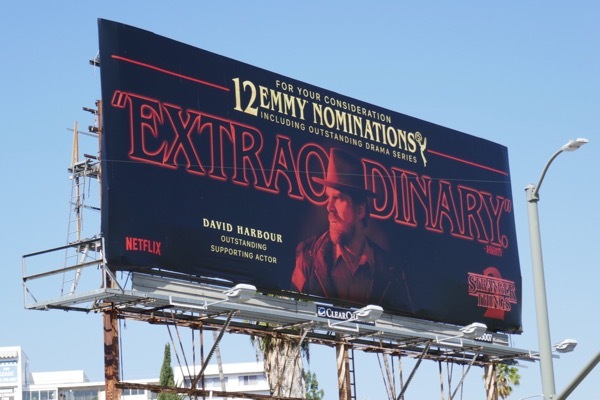 UPDATED: Congratulations to Stranger Things for nabbing twelve Emmy nominations for its extraordinary second season, including nods for Outstanding Drama Series, David Harbour and Millie Bobby Brown. 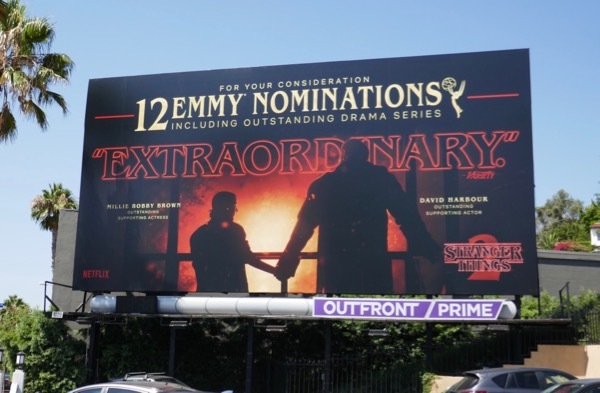 These atmospheric Emmy nominee billboards were spotted along the Sunset Strip and Cahunega Boulevard on August 12, 2018. 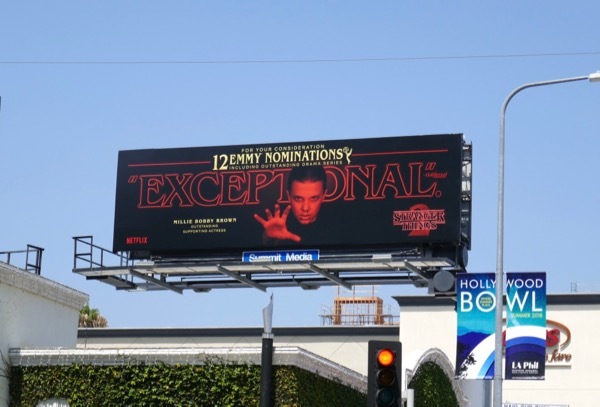 UPDATED: Here's also a duo of billboards for the Emmy nominees photographed on either side of the road at the intersection of Bundy Drive and Wilshire Boulevard on August 17, 2018.